Retired judge Tom Smith shares the story of his return to the Arctic in an icebreaker five decades after serving there as a young constable, and what he found. “For the three years I served as an RCMP constable at Alexandra Fiord and Grise Fiord on Ellesmere Island, in the early 1960s, we never opened a criminal file—we ran a trading store with the Inuit, pulled teeth, stitched cuts, removed a placenta, and ran the post office—mail was sometimes over a year old. With the Inuit, I explored thousands of miles by dog team. The Inuit there spoke no English so I learned enough Inuktitut to get along. S/Cst. 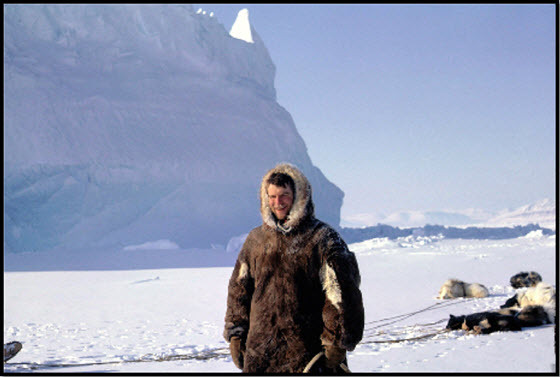 Ningyoo took this photo of me about 1963 with an iceberg to the left, South Ellesmere Island in the background, and my RCMP dog team to the right. I am wearing caribou clothing. 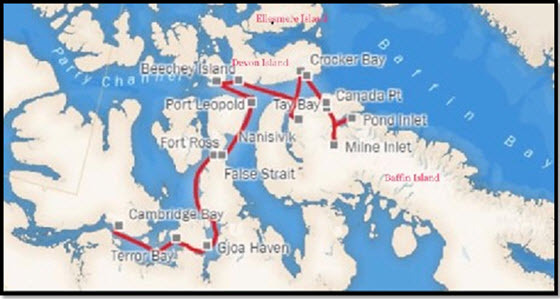 Expedition, a Signature Project for Canada’s 150th Anniversary, was a 150-day sailing journey by the Polar Prince, an icebreaker, from Toronto to Victoria via the Northwest Passage. You can read and see videos and photos about the Expedition at canadac3.ca. In mid August at Pond Inlet on north Baffin Island, where Leg 9 started, and 52 years after I left Grise Fiord on Ellesmere, people at Pond Inlet gathered at a community hall for the announcement of the Lancaster Sound National Marine Conservation Area, an area twice the size of Nova Scotia, where 75 percent of the world’s narwals summer. When I arrived at the hall, before most people, I asked an Inuk woman about Ookookoo, a teenager and respected hunter when I lived at Grise Fiord, Ellesmere Island. Ookookoo soon appeared. I didn't recognize him but we hugged and soon tears welled up in his eyes and then in mine. I remember him telling me that a polar bear charged him, tore his parka, knocked him down, and then left. Since then he has travelled three times by snowmobile to the north pole. Soon children of people I knew on Ellesmere appeared and also grandchildren and a greatgrandchild. I showed them photos I had taken in the 1960s and realized how deep our roots were and how I need to write about my experiences and share my photos from those magical times. Our visits were too short —I left Pond Inlet with my heart aching. And I thought I was in danger.